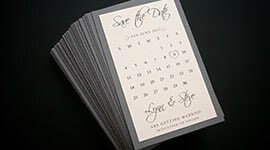 Save the Date cards serve as reminders for your guests that you are going to be getting married. 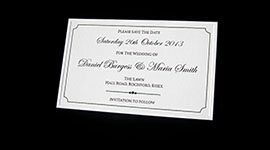 A personalised range with the Bride & Groom's names & wedding date. 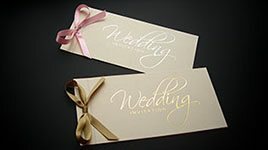 Available in either white or ivory card with a pearlescent finish. 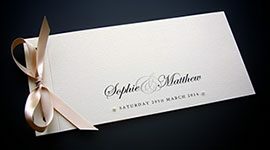 A sophisticated range in a Ivory pearlescent card, finished with a choice of either silver or gold foiled text. 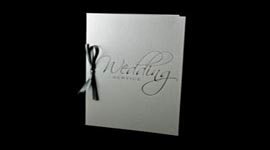 A sophisticated range in a white pearlescent card, finished with silver foiled text. 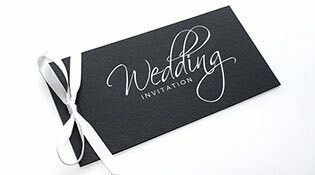 A striking collection of black embossed patterned Wedding Stationery complemented with silver foil writing. 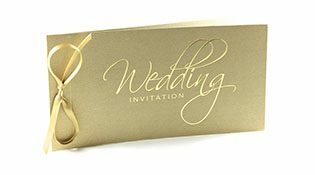 A sophisticated range in a Gold pearlescent card, finished with gold foiled text. 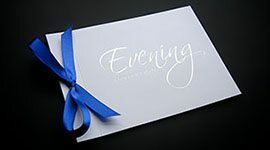 A sophisticated range in a Silver pearlescent card, finished with silver foiled text. 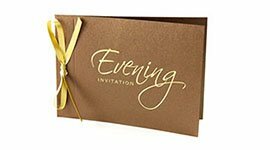 A sophisticated range in a Topaz pearlescent card, finished with gold foiled text. 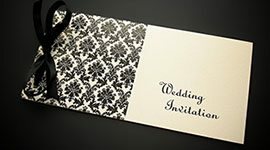 Welcome to our stunning Baroque range, with a Baroque style foiled pattern on pearlescent card, complemented with foil writing. A beautiful range for couples who want to achieve the 'wow' factor whilst keeping costs to a minimum.